I can sit for hours looking at old photographs. Especially the ones from old large plate glass negatives. The depth and clarity of these old photos lets you go deep into the image and see things you would not notice when taken in as a whole. 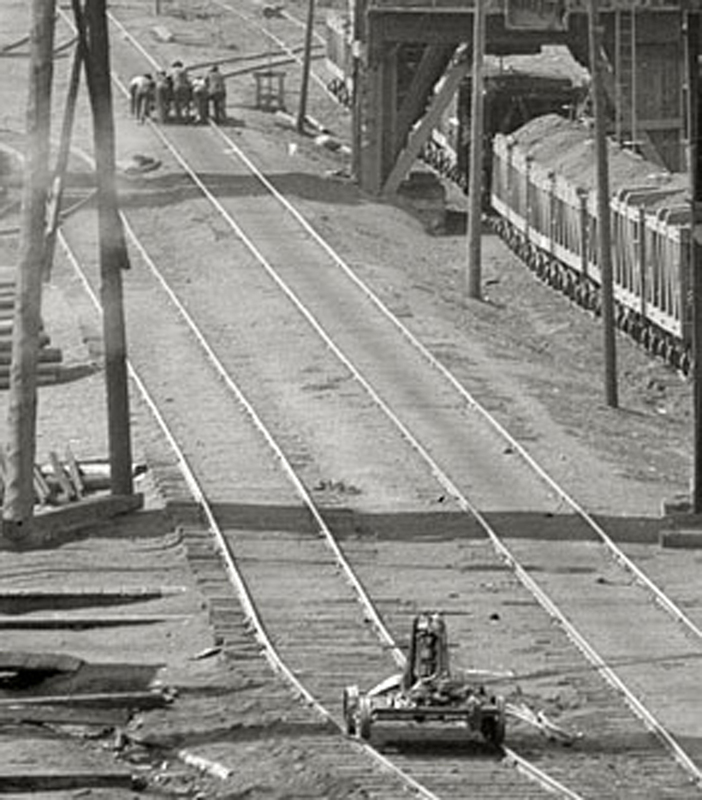 For an example, lets look into this photo of an old iron ore mining location somewhere in the Midwest (I do not remember where this was but i liked the detail when I found it). The main image is full of things happening to the point you can feel this is a busy place. The amount of modeling potential is great even when taken in as a whole. You can click on the image to see a larger view. Original from the Library of Congress. 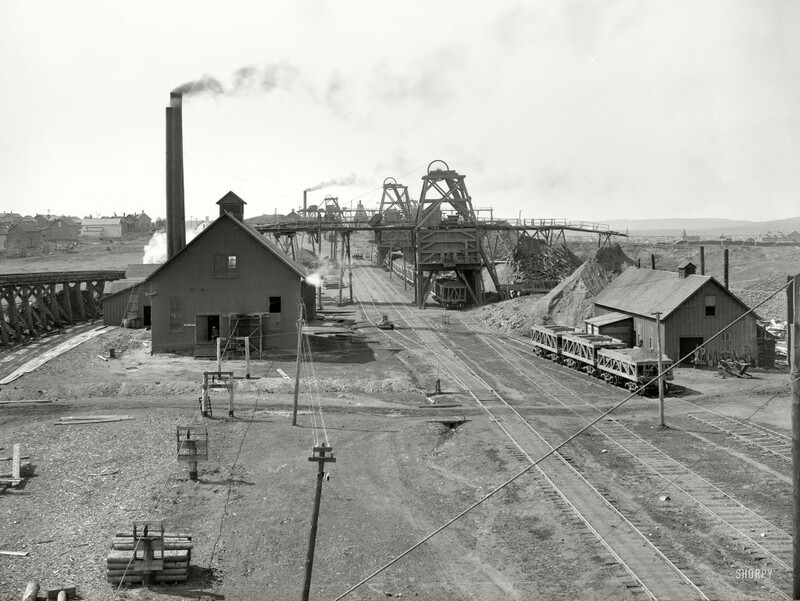 High resolution image of an iron ore mining operation. Lets look deeper now. Each image that follows is from the above image. Each is a scene that can be re-created in model form. 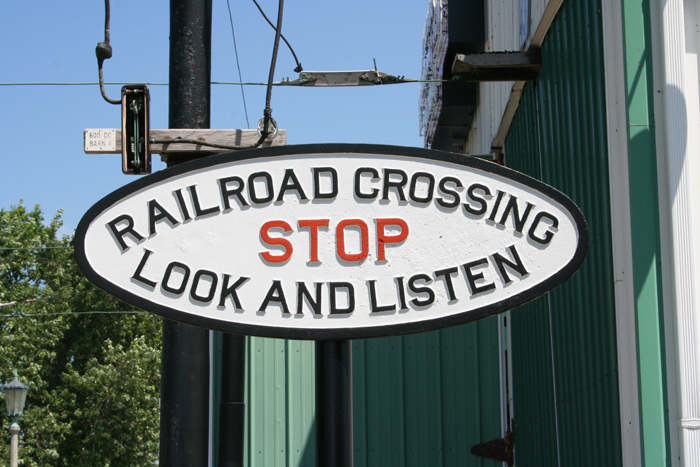 The railroad is still using stub switches but this one has a more modern lever than the others in the original photo. Notice the fresh mound of dirt to the left. The drainage ditch snakes around the stand and a culvert has been made with what look like railroad ties here and near the top of the image. A close look here shows us we are most likely between 1900 and 1914. The line uses air brakes and early knuckle couplers. Note that the switch stand is different from the first image. 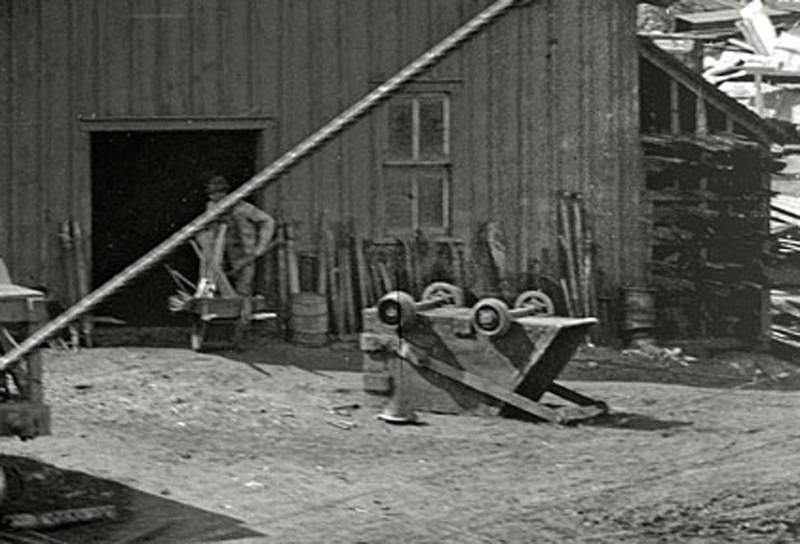 At the top of this image you can see a group of men pushing a car, truck or cart. Near the bottom is a hand cart. 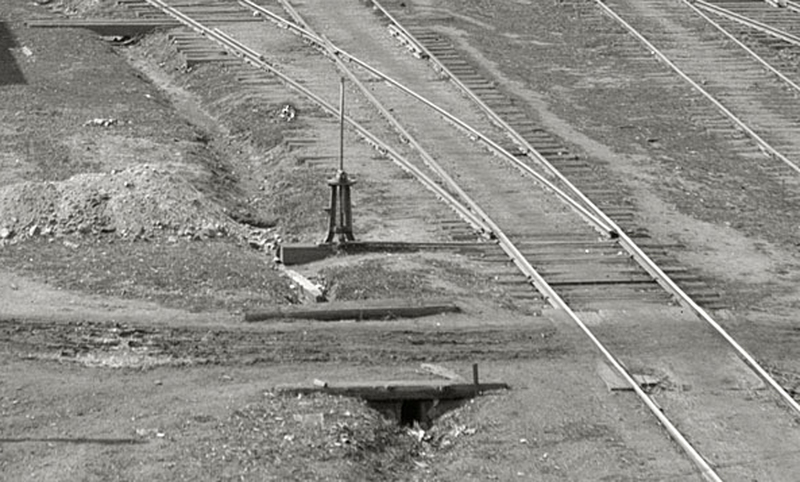 Notice the sharp angle of the turnout in the distance and how it crosses the other track. Here we see how the smoke stacks are anchored with wire. we also see how the electric service mounted to the building. The sign on the door says “NO ADMITTANCE” but the person in the door is looking inside anyway. This building appears to be a repair or blacksmith shop. Materials and tools are stacked against the building. A skip is upside down, presumably to be fixed. It appears the ore cars may need repairs to. The car closest is only partially filled while the other two are not (see larger image). 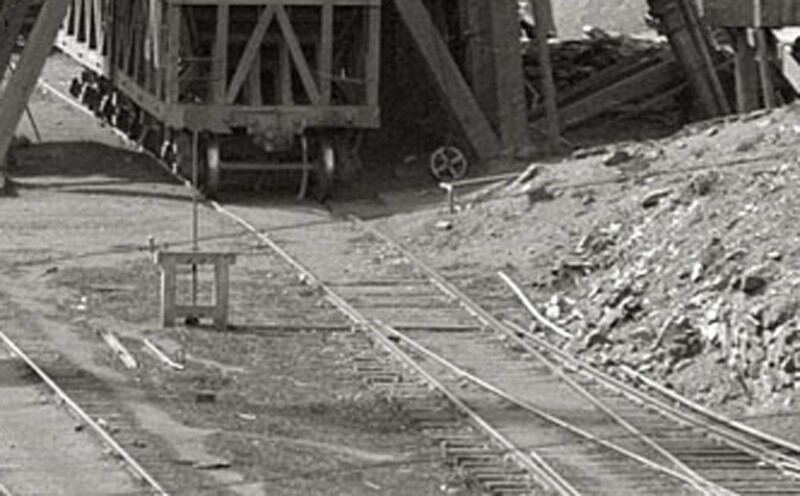 In this closeup view of the head frame, we can see one of the skips tipped up and what appears to be a wagon most likely for tailings. 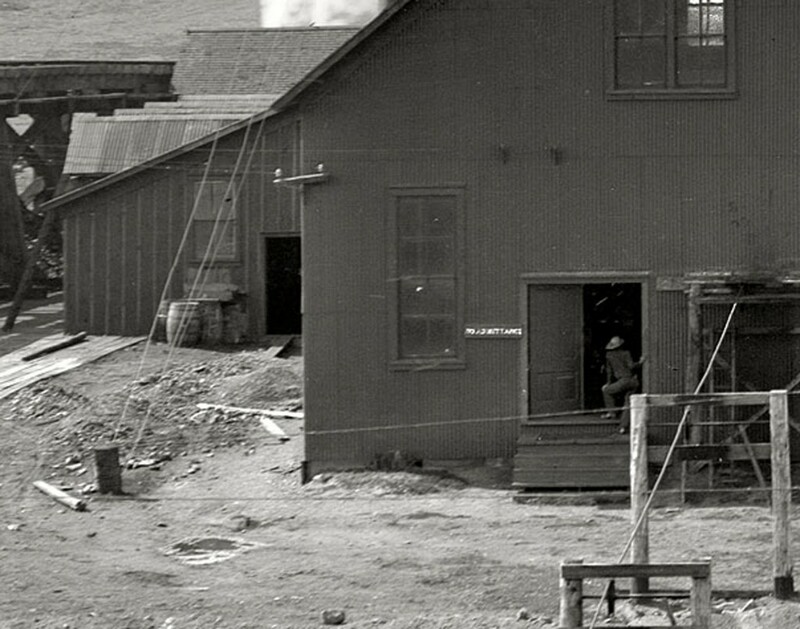 Here we have a view of the adjacent housing which is most likely owned by the mine itself. Some points of interest are; The martin house atop the electric pole.Many structures are on top of piers and do not have foundations. No cars just horses and buggies. Every yard has a fence and types are varied. The best site for looking at old photos like these are the Library of Congress (LOC) Digital Collections and Shorpy. Shorpy uses the LOC images but makes searching them and viewing easier. They also provide an RSS feed so as new items are brought on-line a notification is sent out. I often use Shorpy as an index and then search the LOC for the high-definition version.